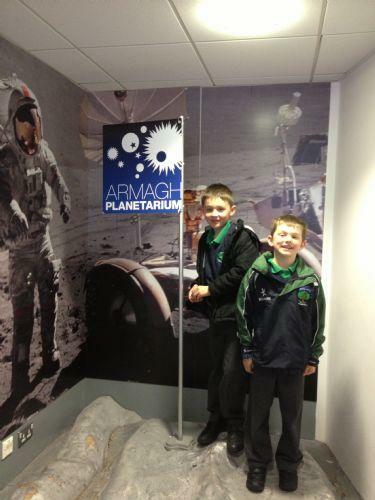 Year 4 had a great day learning all about Space and electricity in the Armagh Planetarium. After our journey on the bus (where we got to watch a DVD!) we met our tour guide, Kerry. She took us to a workshop about electricity. It was very interesting, Mr Greer and Mrs Halsall even learned a thing or two! The static electricity in our hair made a balloon stick to the wall and lifted things out of Reuben's hand! Electricity also travelled through our bodies and lit up light tubes and even Beth's shoes! Then we went into the big dome and watched a great show about all the different planets. Kerry also explained about the different constellations and told us some of the stories. Finally we had a look around all the exhibits and played in the interactive area.